Voting on articles in the fourth judicial package is expected to start in parliament next week. The full PDF of the Amnesty report can be accessed here. The dust has almost settled after the fallout from daily Milliyet’s controversial publication of the “İmralı leaks.” The paper’s reporting of leaked details of the meeting between imprisoned PKK head Abdullah Öcalan and a parliamentary delegation shook the media agenda two weeks ago, and was widely condemned by government officials as an attempt to “sabotage” the ongoing peace process. In fact, the episode has not had this effect, but it has managed to expose the fragile state of media freedom in Turkey once again – it’s regretful that such bold government criticism of the media has become increasingly familiar of late. Prime Minister Recep Tayyip Erdoğan led the reactions from the front, repeatedly singling out Milliyet in the days following the leaks. “If that’s how you’re doing your journalism, shame on you! The media will say [the same thing] again: The prime minister is attacking us. But whoever tries to spoil the process in the media is against me and my government. There cannot be limitless freedom,” he said, before calling on the media only to report “in the national interest.” Of course, given Erdoğan’s past record on such matters it’s not surprising to hear him once again hitting out at media coverage that he considers inconvenient. However, the apparent emotion behind the outbursts on this occasion is probably related to the fact that his personal political destiny depends to a large extent on the success of the current peace talks. 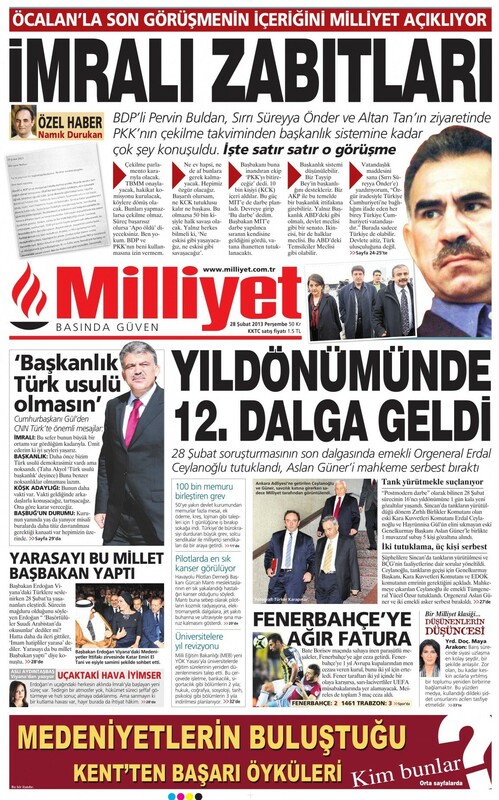 Milliyet’s front page on Feb. 28, announcing the leaked details of the İmralı island prison meeting between Abdullah Öcalan and a parliamentary delegation from the BDP. Rumours circulated that sackings and resignations from Milliyet would follow the leaks, but editor-in-chief Derya Sazak wrote a robust defense on the Monday following Erdoğan’s words: “If the story is accurate, which it is, we print it. We do not take the prime minister’s words upon us.” Nevertheless, the criticism evidently had an effect, as veteran writer Hasan Pulur’s column did not appear on the same day, and it was also widely reported that the paper’s owner wanted government critics Can Dündar and Hasan Cemal to be removed on the prime minister’s order. Indeed, Cemal has not appeared in Milliyet for two weeks since the İmralı leaks, although no official announcement has been made. Dündar and Cemal are perhaps surprising names for Erdoğan to target, as – despite often being critical of the ruling AKP – both have expressed their support for its current peace process. In an interview with daily Akşam, Alper Görmüş – the editor-in-chief of political journal Nokta when it was closed down under military pressure in 2007 – also said Milliyet was right to print the leaked minutes, stating that he too would have published them if he was in the same situation. “The media has no mission to side with the political power. It should stand by the truth. A contribution to the process of a solution can only be realized by writing the truth and the facts, not by hiding them or by exercising self-censorship. “Jail and detention have been the focus with regards to Turkey, but the real threat to the media remains (under an old, well-known dark shadow of the power) owner-induced censorship and self-censorship, including being banned from writing on specific subjects. Actually, the situation is rather more urgent than Cengiz suggests. The fact is that the damage that “would” come from self-censorship has already been occurring for quite some time. On Monday (Oct. 22), the Committee to Protect Journalists (CPJ) released a detailed report on the state of press freedom in Turkey, under the gloomy title: “Turkey’s Press Freedom Crisis – The Dark Days of Jailing Journalists and Criminalizing Dissent.” Although it seems like reports on the subject are released every month, this one received a huge amount of attention, both domestically and internationally. It describes the numerous instances of restrictions on media freedom, citing the familiar examples of the Ergenekon case, the endless prosecutions of journalists writing on Kurdish matters, the increasingly widespread practices of intimidation and self-censorship, as well as the ruling Justice and Development Party (AKP) government’s rising intolerance of dissent. “The committee had come under fire for reporting lower estimates of the number of jailed journalists than other human rights organizations. Turkey’s government has long maintained that only a handful of the journalists were charged with offenses related to their jobs, and because the CPJ hadn’t read all the indictments, it had erred on the side of caution. The ruling Justice and Development Party (AKP) held its key congress on Sunday (Sept. 30), the slogan of which was “Büyük Millet, Büyük Güç, Hedef 2023” (Great Nation, Great Strength, Target 2023). Throughout his emotional two-and-a-half hour speech, Prime Minister Recep Tayyip Erdoğan was in full neo-Ottoman mode. He told the 10,000 delegates packed into the Ankara arena that the government was following the same path as Sultan Mehmet II (the conqueror of Constantinople) and Selim I (“The Grim,” who expanded Ottoman territories to the east during the 16th century). He even went so far as to declare – tongue only half in cheek – that the AKP’s new target was 2071, linking the party back to the first Turkish Anatolian state-builders of the 11th century, 2071 being the 1,000th anniversary of Seljuk Turkish leader Alp Arslan’s entry into Anatolia. 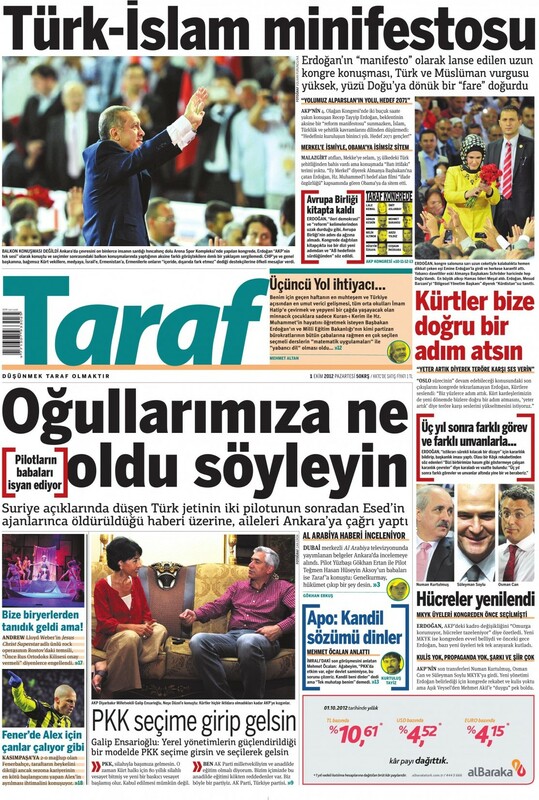 Liberal daily Taraf agreed that the congress constituted a Turkish-Islamic “minifesto,” but struck a rather more sceptical tone: “There was a strong Turkish and Muslim emphasis, a mouse with its face turned to the East was born,” (in Turkish, “a mouse was born” means that something underwhelming took place). 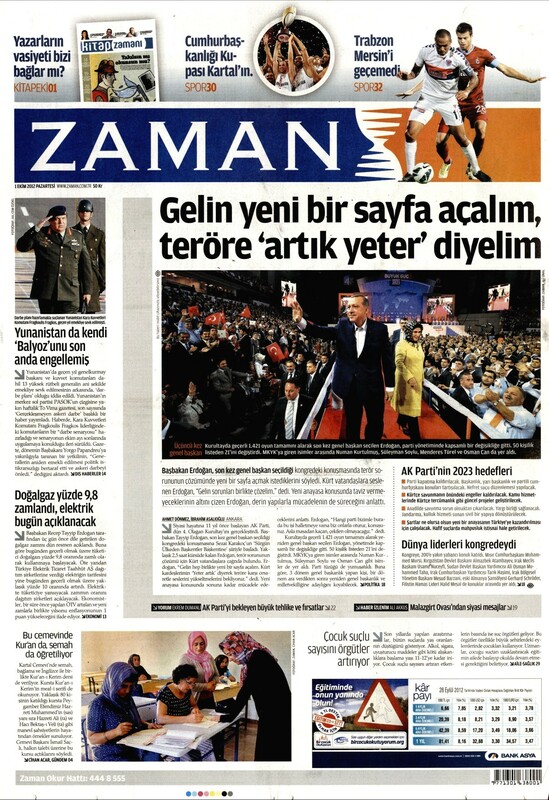 The paper also noted plaintively that Erdoğan had failed to mention the European Union even once during his speech. Meanwhile, seven national newspapers were refused accreditation to attend: Cumhuriyet, Sözcü, Evrensel, Birgün, Aydınlık, Yeniçağ, and Özgür Gündem. These publications have diverse sympathies: from left to right wing, from Turkish to Kurdish nationalism. The only thing shared by all is antipathy towards the government. “Established six months after the founding of the Turkish Republic, our newspaper has been published for 88 years. During periods in the past when democracy has been suspended by the ruling powers our newspaper has been closed down, but outside of this we have always published under the principles of freedom of the press, in the name of people’s right to know. In 21st century Turkey, our newspaper is now exposed to censorship by the ruling powers. The piece went on to detail two constitutional and legal articles that it alleges the congress ban violated: Article no. 69 of the Turkish constitution, which states that internal political party activities, arrangements, and workings must not run counter to the principles of democracy; and Article no. 93 of the Law on Political Parties, which states that decisions taken and actions performed by party central administrations and affiliated groups must not run counter to the principles of democracy. “The news that reporters and journalists from some press organs are not allowed to enter the AK Party’s Congress is very worrying. “Monitoring this historical event of the ruling government party on the spot and transferring it to its readers and viewers are primary duties of news media. It is not particularly gratifying to scratch around the dregs of the Turkish press, but here’s the latest sludge I have been able to dredge up from the bottom of the barrel. You only have to do a quick search on Google or YouTube to easily find thousands of articles and videos insulting Christianity (and Christians), Judaism (and Jews), or Islam (and Muslims). 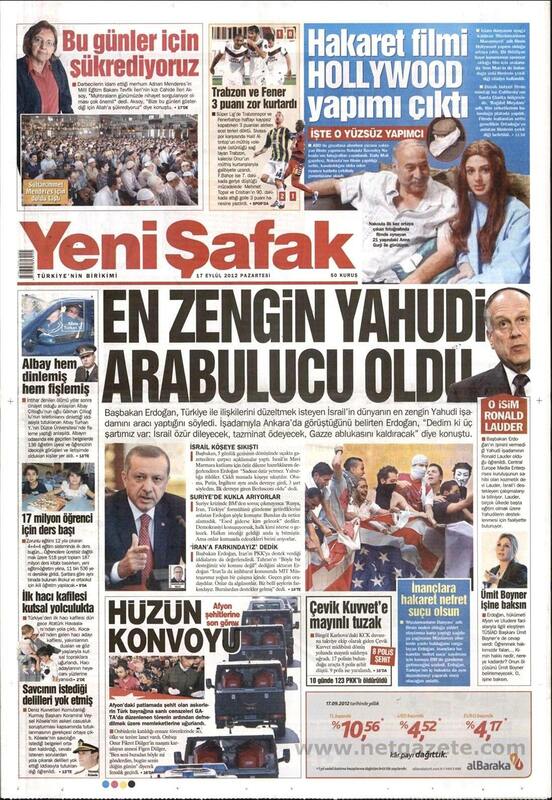 None of it is very nice, but thank God the world’s Jews don’t rise up in violent protests every time an offensive headline or story appears in a Turkish or Arabic newspaper.